And here today, for your reading pleasure, is my new friend and the fan-tabulous illustrator, Katie Kath, all the way from North Carolina--hiya, Katie! Uh, Katie...what are you doing...? While Katie's putting away her sketch pad and settling into her seat on the front porch of the TeachingAuthors tree house, I'll tell you a little about her. 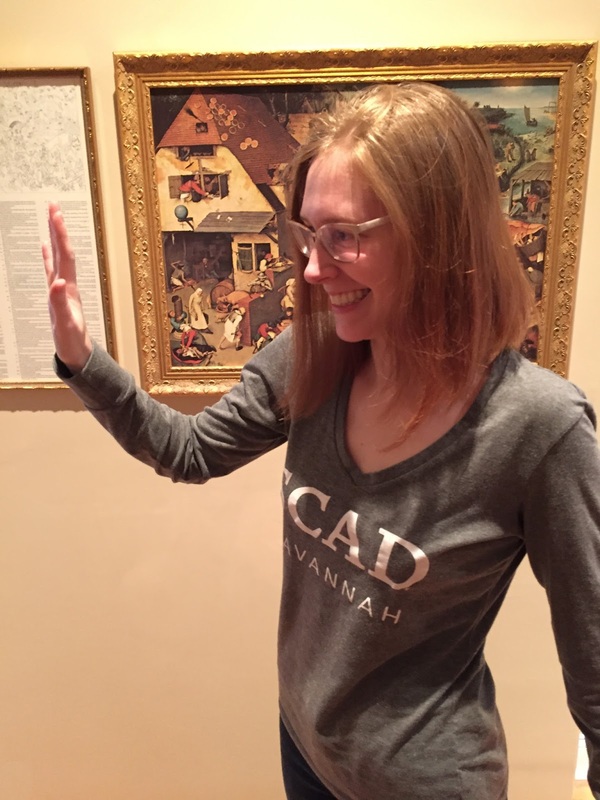 She graduated from Savannah College of Art and Design (SCAD) with a Master's degree in illustration. 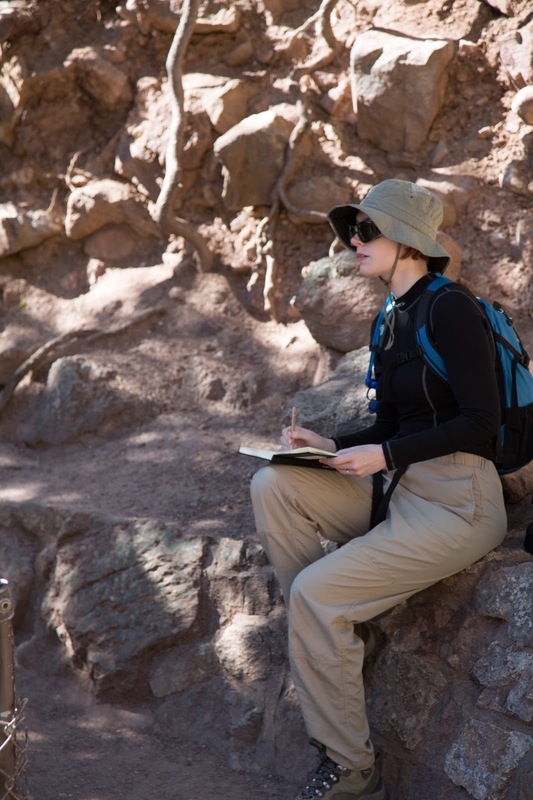 Her career was jump-started when she won one of two SCBWI Student Illustrator Scholarship awards in 2013. Shortly thereafter she was picked up by Justin Rucker, an agent from Shannon Associates, and now spends countless hours happily working on her colorful and unique illustrations in her studio. 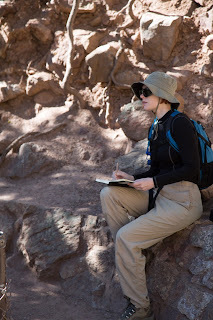 Katie loves to work primarily in watercolor and ink, sometimes accompanied by collage. She lives in those rolling hills of North Carolina, with her husband and their cat, Pangur-Ban. ​Katie, while you're sipping this iced tea, could you tell us more about your rocketship-​to-​the-​moon career path and how my manuscript came to you? Towards the end of my schooling at SCAD, I pretty much had no clue where my career would go from there, which was a pretty terrible and scary feeling. So, you can imagine my elation when a few images I submitted to the Society of Children’s Book Writers and Illustrators (SCBWI) won the Student Illustrator Scholarship in 2013! This is what started my career. From there, I met Justin Rucker, and have made countless professional connections through SCBWI. Can you describe your initial thoughts and your illustration process as you worked on More Than Enough? My initial thoughts were, “I gotta hit the books!” because I knew nothing about Passover and the traditions involved in the holiday. 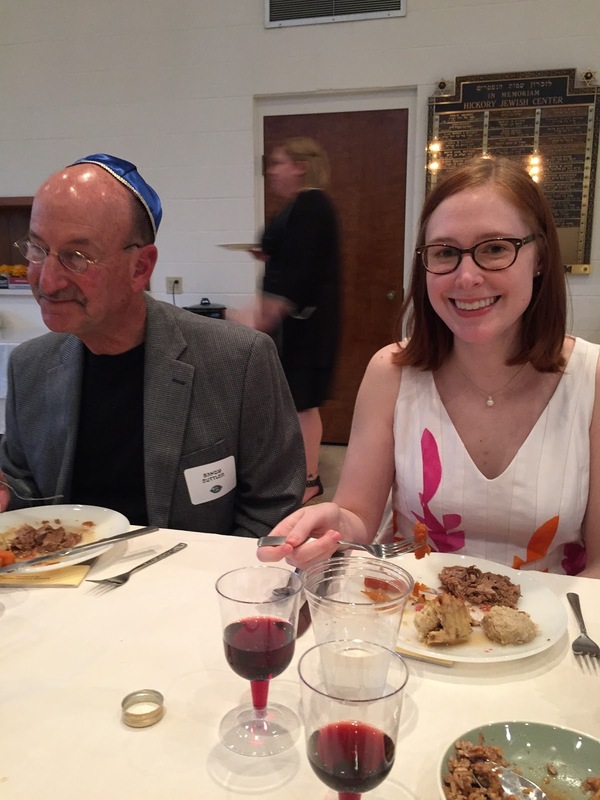 I spent the next few months and beyond studying Jewish culture and the Passover celebration. her first Passover Seder (meal)! As far as my process goes, the first thing I focused on is creating the characters in the book because they really make the story come alive. I offered a few different options of each character to the publisher and we settled on the characters you now see in the book. Illustrating a book is a very involved endeavor. It involves a process of research, planning, thinking, doodling, sketching, and re-working—and More Than Enough was no stranger to this process! This is a Passover book...could you talk a bit about this aspect of the book and how you handled it in your art? I knew what I needed to do was familiarize myself as much as I could with the Passover holiday and its traditions. I read a lot about it on this fabulous website called chabad.org, I read and re-read the Haggadah, and I also read a wonderfully informative book called The Jewish Book of Why. Of course, I made sure to attend a Passover meal as well! 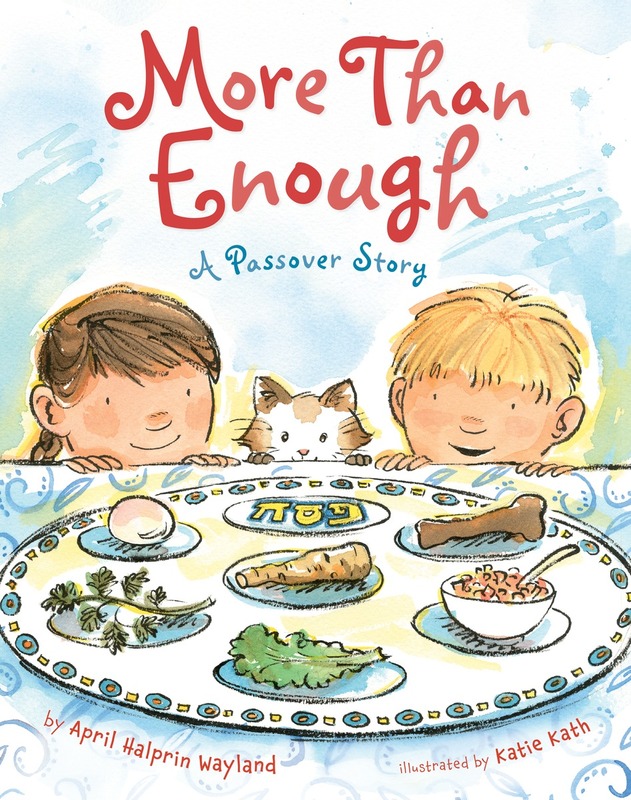 I knew that if I was familiar enough with Passover, I could create artwork that did not rely on stereotypes to tell a successful visual story about the holiday. I wanted to let my readers know that the point of this book was its theme of love, thankfulness and family, which is approachable to anyone, regardless of religious affiliation. And your illustrations convey those themes beautifully, Katie. 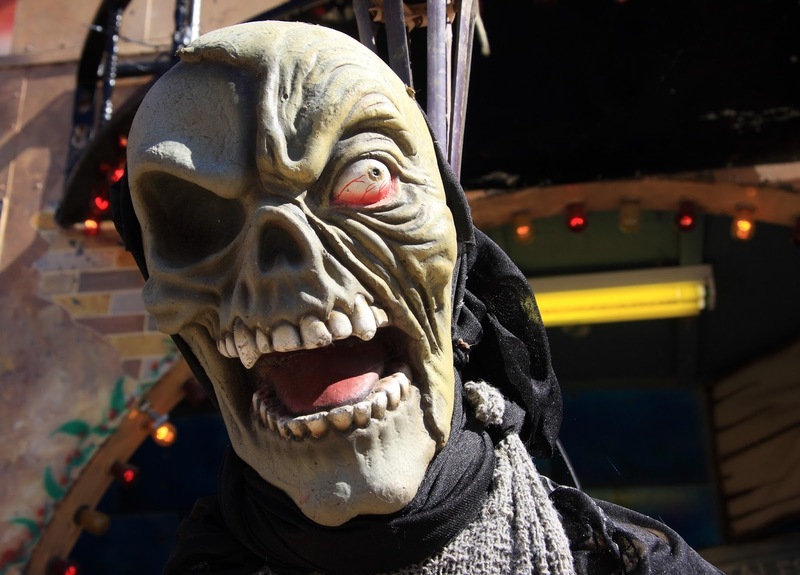 Switching gears now, tell us one surprising thing about yourself. Fun fact about myself? When I was little I was really into opera (yes, opera. Like Mozart, Gilbert & Sullivan, Bizet…) and I loved to illustrate some of my favorite operas after watching them! I love that! What's next for you, Katie? The books that everyone can expect to be coming out next is "Weekends With Max and His Dad" (Linda Urban) "What a Beautiful Morning " (Arthur Levine) "Nora Notebooks 2: The Trouble With Babies" (Claudia Mills), and "Come Over To My House" (by Theo LeSeig, aka Dr. Seuss). Projects I'm working on now are "My Kicks" (Susan Verde), "Nora Notebooks 3: The Trouble with Friends" and a second Max and His Dad book. Katie concludes, Phew! Lots o' books! how 'bout a cross-country high five! Thank you for stopping by, Katie...now get back to work on all those luscious books! 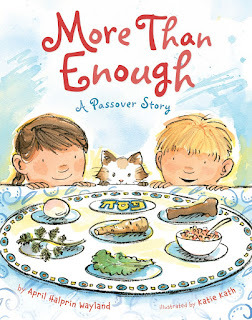 And thank you, Campers, for reading all the way to our cross-country high five...and remember to enter our book giveaway for an autographed copy of MORE THAN ENOUGH ~ A Passover Story, as described at the bottom of the last post. 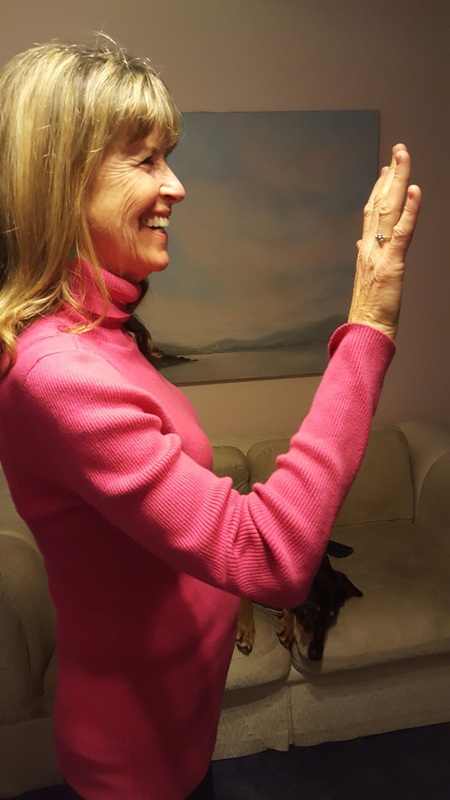 posted after a happy day of book signing by me, April Halprin Wayland, with the assistance of my trusty pup, Eli. Loved this! So wonderful to hear from Katie. 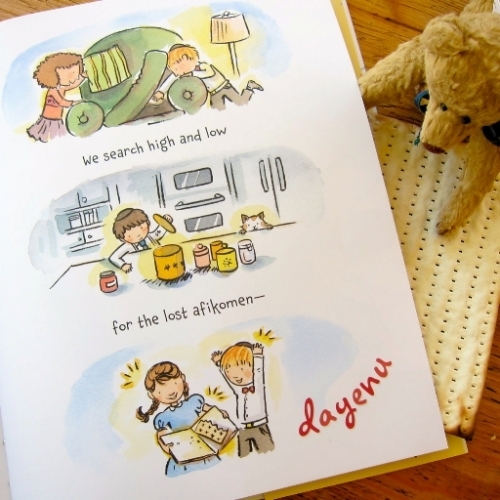 Her illustrations exude such joy. Cool that she used to illustrate operas, too. Looking forward to all her new books. Best high five ever. Thanks, both of you! Thanks, Jama! I'm still swimming in the gorgeousness of YOUR post--awesome, though overused, it the best word for it! Tremendous start of a shining artist's career. I love knowing about the indepth research. Will be watching out for the artwork in books by Katie Kath. And I've mentioned this elsewhere, but Brava! for this new, so joyful sounding, passover book. Jan Godown Annino ~ Yes, indeed a shining artist on the start of her journey! And thanks again for your words, which warm my heart. Carmela ~ Yes, Katie is incredibly busy--and incredibly prompt at responding, so she much be pretty organized. Wow!